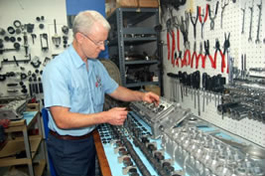 Mike was the founder of Bavarian Machine Specialties. Passing away in 2010 he was a true artistic virtuoso of his craft. The majority of his time was spent in the shop diagnosing and repairing BMWs. Working on cars that demand a high level of technical skill is what drove him every day. He believed he was fortunate not only to be following his passion but to have had the opportunity to build a unique BMW shop utilizing his commodious, capacious, boundless years of BMW technical experience. In 1980, when he first opened for business, the original shop concept was simple – and is still true today: stay current with extensive training and equipment updates but maintain an old-world craftsman’s approach to working exclusively on BMW automobiles. 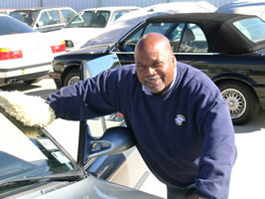 This strategy instantly distanced the shop’s reputation from the industry trend of a rushed “flat rate” approach of repairing “cars” and enabled the shop to provide BMW-specific services of a greater variety. As the owner, he placed great of importance on cultivating people who enjoy the experience of doing a job for the satisfaction of doing it well. This has resulted in a cohesive and committed team of like-minded professionals throughout every level of the shop for which he was and we are today very proud of. Sergio has been with the company in varying degrees since 1999. Sergio is one of those individuals that makes it possible for Bavarian Machine Specialties to be more than just a service and repair shop. His talents enable us to offer design and fabrication options that other repair shops cannot accept. Sergio enjoys all performance work such as brake and suspension upgrades and spends a substantial amount of time in the shop honing his skills working on race cars. Brian has become an invaluable asset to BMS since 2001. Without his behind-the-scene efforts it would not be possible for the shop to operate effectively. Whether he is lending a hand in the shop, cleaning your car or shuttling you to work, he will always have a smile on his face. Brian adds another extension to the shop by providing a detail service. His goal is to maintain your car cosmetically. Imagine the convenience of having your car repaired and the leather seats conditioned at the same place? 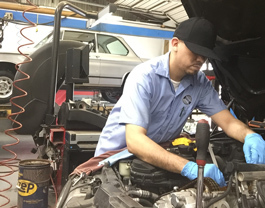 Brian knows that no matter how well the technicians do their job, it will be his finishing touches that you notice when you pick up your car. Dan has been with the company since 1992. Over that time has matured into the consummate BMW technician. He prefers work that requires a high degree of finesse. 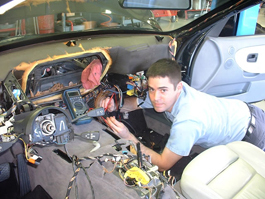 It is not unusual to find Dan working on a car with the dash removed repairing an AC system leak or tracing an electrical gremlin. Dan also enjoys troubleshooting such things as engine performance problems or emissions-related failures. To a large degree Dan handles most of the interior trim replacement / repair, window and window lift mechanism replacement /repair and electrical accessory installations (stereo systems, I-pod, satellite radio, Bluetooth systems, etc.) He always performs his work with a cautious eye for the details, and it is his kind of aptitude that gives our shop the advantage in providing skilled craftsmanship on technically challenging jobs. Alex is the newest addition to our technical staff. He has been a BMW FACTORY trained technician since 1999. He has transitioned over to BMS because he holds a very high standard and opinion of how he believes a BMW should be taken care of for “long term ownership”. Alex strives to diagnose and advise on repair needs in a timely fashion, always taking into consideration our customers busy schedules as well as their BMW’s maintenance needs. He does this efficiently and with purpose; however, he will not compromise the craftsmanship he believes in and BMS has always endeavored to maintain. As a seasoned, honest team player he is always ready to assist fellow coworkers and customers right when the need arises. He is comfortable and confident with adjusting to the continuous technological and dynamic advances in BMW engineering as they progress each year. He has the mindset of moving along with the times mechanically speaking; therefore, being able to offer the best possible repairs to the late model BMW’s. In his spare time, Alex has many hobbies. Some of his favorites include building and creating props for EDM music, DJ sets and his love of working with LED’s and lighting effects. The parts position at Bavarian Machine Specialties requires a very special individual that has a unique mixture of talents. Chris has filled this area since 2009. He is engulfed in having a working BMW parts, general automotive parts and technical automotive knowledge plus a technical background in computers that enables him to easily navigate the intricate parts programs required to keep an accurate supply of inventory on hand to support the shop. 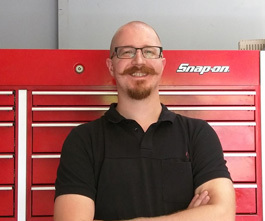 Chris also has a keen interest in the performance oriented side of the shop and maintains the inventory of parts for race car applications as well as the standard street performance upgrades for everyday cars. In addition to assisting in the daily operation of the shop and being the first person you will talk to when you call, Maricela’s main focus is customer follow-up concerning past and future work. She has taken on the difficult task of providing a proactive guideline for maintaining your BMW. 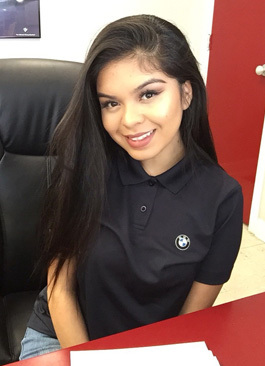 She understands that the hardest part of ownership is not finding a place to work on your BMW, but finding someone to properly advise you for the most cost-effective long-term approach. Maricela knows waiting for something to break down or a light to come on is always inconvenient and more expensive. With Maricela’s assistance for updates or appointments, you can be assured your BMW is always being looked after and not just when it is in the shop.